There were 668 press releases posted in the last 24 hours and 153,337 in the last 365 days. LONDON, GREATER LONDON, UK, September 25, 2018 /EINPresswire.com/ -- A report from The Business Research Company, Telemedicine Technologies Global Market Opportunities And Strategies To 2022, shows that the global tele-surgery technology market, which relies on robots to physically perform operations, will more than double in size between 2018 and 2022. Growth in the tele-surgery market has accelerated recently. The factors contributing to this growth include the increasing accuracy of surgery performed by robotics under the control of healthcare professionals, the low cost of treatment compared to surgery performed physically by a doctor, the increased need to provide healthcare services to remote areas, and the decreased risk to doctors from harmful X-rays and radical medicine. There are, however, certain factors which will hinder the growth of this market. These include limited hand-eye coordination when using the technology, poor vision through the tissues, and limited dexterity. In addition, tele-surgery is the costliest type of tele-medicine technology application; it requires significant capital formation and has high operating costs. 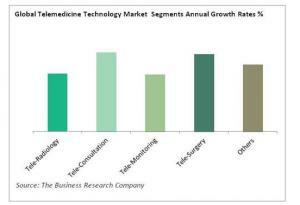 As the chart shows, all segments of the tele-medicine technology market are growing rapidly. The fastest-growing segment, tele-consultation, provides virtual communication between healthcare professionals or specialists at two different locations to share opinions about a difficult care issue or between a patient and healthcare professional to consult about diagnosis and treatment through tools such as web conferencing or audio/video conferencing. The market for tele-consultation is expected to particularly rapidly during the forecast period owing to the way it facilitates consulting with a healthcare professional to take a second opinion, easy assessment, lack of availability of sufficient healthcare professionals in remote areas, and increasing awareness of the benefits across the patient population. Telemedicine technology itself consists of the technological hardware and software and associated services provided by technology companies for use in telemedicine. Examples include universal collaboration servers, virtualization management, resource management, recording and streaming, open API’s and remote access technologies, desktop video and voice products, software and infrastructure and virtual versions of infrastructure components, immersive studio systems, cameras delivering the highest video quality, surgical robots and software for audio endpoints. Telemedicine Technologies Global Market Opportunities And Strategies To 2022 is a new series of industry report from The Business Research Company that provide a market overview, analysis and forecasts of market size and industry statistics, market growth rates, market trends, market drivers, market restraints, market revenues, market shares and company profiles of the leading competitors in over 300 industry reports, covering over 2400 market segments and 60 geographies. The industry reports draw on 150,000 datasets. Extensive secondary research is augmented with exclusive insights and quotations from industry leaders obtained through interviews. Market analysis and forecasts are provided by a highly experienced and expert team of analysts and modellers.